For our fourth week in the Make It Last Build Series, we’re looking at how to turn our electronic thermometer into a data logger by adding storage capability. You’ll probably want to check out the most recent newsletter for background data, before continuing with this post. Also, before we forget, we’re getting to the end of our first build. Hopefully, you’ve been following along, and have most of the pieces in place to finish your project. The entry deadline is 11:59pm PDT on November 12, 2010, so make sure to submit your project by then! As a reminder, you don’t need to purchase anything or build our sample project to be eligible- you just need to build any device that runs on batteries and can collect some form of environmental data. See the official rules for specifics on all this and what prizes you can win. Finally, If you have any questions about this project, or ideas for it you’d like to share, head on over to the MAKE Forums topic and sound off. Now, to build our data logger! Here is the schematic for the data logger. To make it a bit easier to understand, I’ve broken it up into five sections — the microcontroller (components that are required to get the microcontroller running), programmer (the port used to connect a PIC programmer), sensor (for our example, a thermometer), serial port (header to connect an FTDI cable), and data storage (the EEPROM memory chip and related parts). Circuit schematics can be confusing to look at, so a good strategy is to try and break them into smaller pieces. 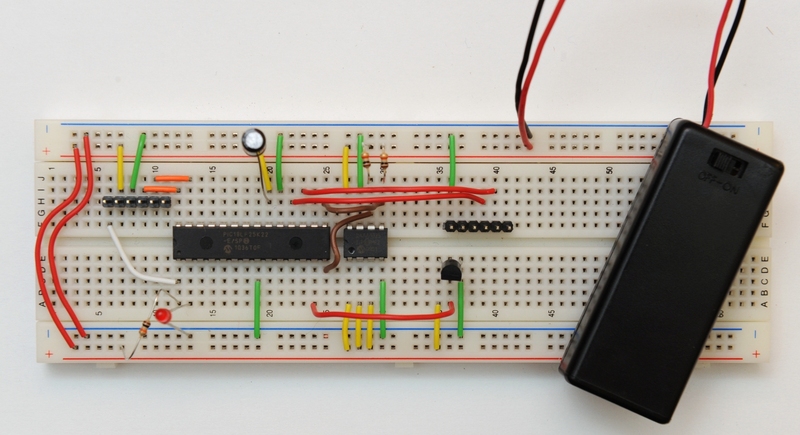 This can also be helpful when looking at the actual circuits — can you identify which components on your breadboard correspond to each of the above sections? Your circuit should already have the first four sections, or everything except the data storage portion. Place the EEPROM chip in the breadboard, to the right of the microcontroller. After it is seated, connect the power and ground wires as shown above. Pin 8 should be connected to power, and Pin 5 to Ground. Next, we need to add some wires to tell the EEPROM how to behave. First off, we need to configure the serial address that the chip will respond to. When the microcontroller wants to read or write from the memory, it first has to send the address of the chip over the i2c serial line. By adding an external way of configuring the address that the device responds to, the designers made it possible to hook up and use multiple EEPROM chips at the same time, without them conflicting with each other. We only have one chip, so let’s configure it to respond to Address 7 by connecting wires from EEPROM Pins 1, 2, and 3 to power. Next, we need to tell the chip to allow both reads and writes to the chip. To do this, run a wire from the WP pin (Pin 7 on the EEPROM) to Ground. The EEPROM chip communicates with the microcontroller over an i2c serial bus. The bus uses two wires (clock and data) to pass messages back and forth between the two devices. Hook up the clock line by connecting microcontroller Pin 14 with EEPROM Pin 6, and the data line by connecting microcontroller Pin 15 with EEPROM Pin 5. The other thing we’ll need to do is add pull-up resistors from both of these lines to power. These are necessary because devices on the i2c bus use open collector outputs, which help prevent issues if both the EEPROM and microcontroller were to send data out over the serial line at the same time. Note: Some microcontrollers have pull-up resistors built-in, so that you don’t need to supply external ones. You need them for the 18lf25k22, though! Now, we need to add a wire to allow the computer to send serial data to the PIC. Connect Pin 18 on the microcontroller to Pin 4 on the serial header. Note: In the thermometer project build, I showed an optional resistor between the FTDI serial cable and the PIC, because I was using a 5V serial converter. I found out how to convert my adapter into a 3.3V version, so I removed the resistor for this build. Finally, connect up the battery pack! Wire the positive lead (red) of the pack to the Power rail, and the negative lead (black) to Ground. A battery pack with an on/off switch will work best, since you will want to be sure it is disconnected while using your programming cable. If that worked, you are all set to go. Unplug the PIC programmer, turn on the battery, and type ‘b’ to begin logging. At this point, you can disconnect the data logger from your FTDI cable, and set it somewhere for a while to gather temperature data. By default, it grabs the temperature every 10 seconds, but you can change this by modifying the value of the variable ‘logInterval’ in the source code. That’s all for now. Next week, we’ll make the project energy-efficient by configuring the processor to shut down between measurements, work on making the measurements a bit more precise, and make a simple GUI to display the collected data using Processing.